With the increase of the main spindle speed more than 2,000 rev/min and up to 30,000 rev/min in general, we have often observed the apparent discrepancy between the theoretical and experimental values in the stability chart. Even in discussing both the theoretical stability charts, which are produced by using the measured parameters in the “Structural Expression”, i.e. equivalent mass, damping coefficient and spring constant obtained, for example, from the impact testing, while main spindle is still stand and rotates, we can observe also similar behavior as shown below. In such cases, we have relied on the chatter theory established in the 1960s by Tobias, Tlusty and Merritt (Traditional Chatter Theory), and importantly, the main spindle speed was less than 2,000 rev/min on that occasion. 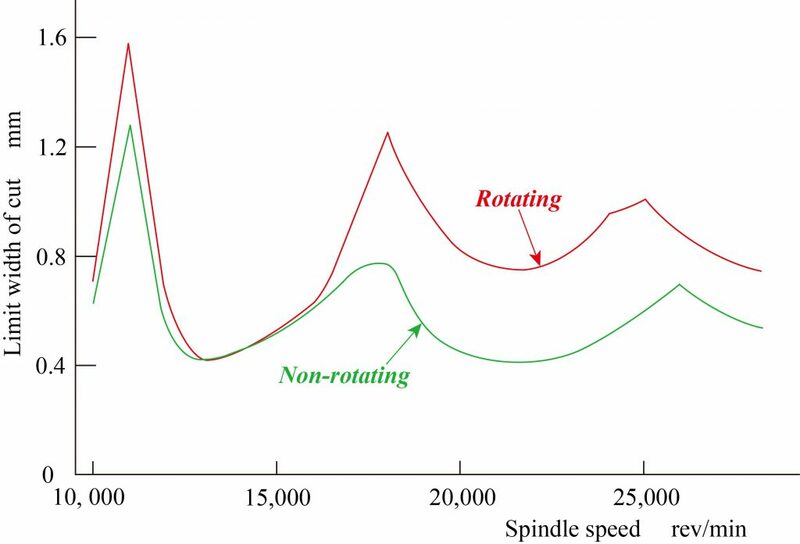 In consequence, it is no doubt that such an impact testing was meaningful because such differences in the spindle rotating speed do not induce the significant influences on the measured parameters. Along with such discrepancies in the stability chart, furthermore, we have faced at present a handful of unknown chatters while machining the aircraft component made of Al alloy with higher-speed, which cannot regulate by the traditional chatter theory. As suggested in Part II, we must be aware of the growing importance of advanced signal processing for the chatter behavior when unveiling the unknown chatter. In contrast, we can find only few challenging research papers, review papers, technical reports and so on, which have tried to unveil the essential features of the chatter occurring at higher-speed machining. These have duly intended to clarify also the reasons of such a discrepancy in the stability chart, and can give us some clues and implications to solve the facing problems. In short, we need now to establish a new chatter theory, which is available for the higher-speed machining at present. This e-book provides the researcher and engineer with valuable suggestions, when they will conduct the research into the establishment of an advance chatter theory available for the machining environments at present. For such purposes, we must improve, at first, the three basic expressions within the traditional chatter theory in consideration of the new factors as indicated in an advanced block diagram for chatter loop by the red letter. The book consists of two Parts, and some quick notes for each Part will be given below. On the strength of the present perspectives in the research and engineering development as shown in “Headnotes of Part II and Chapter 4”, the editor discusses and summarizes what are the facing problems and also to what extent we must revise the traditional chatter theory for the establishment of an advanced chatter theory in this book. In Part I, we describe first the fundamental knowledge about the chatter in turning together with the three burning issues, i.e. (1) Lower-speed Stability, (2) Rational Determination of Chatter Onset in Experiment and (3) Influences of Attachment on Chatter Stability, in Chapter 1. For the latter two of three, we have been aware of their great importance; however, it is regrettable that people in chatter concerns are not so interested in such research subjects, although we can observe several forerunning researches at present as exemplified in Items 1.1.2 and 1.1.3. Following the chatter theory for turning, then, we deploy it to those for drilling, milling and grinding by extremely revealing their characteristic and differing features as compared with those in turning. Importantly, the grinding mechanism may be apparently regarded as one of the variants of milling; however, we can observe the very differing behavior of the chatter in grinding. Such differing behavior are derived, for example, from the non-uniform elasticity of the grinding wheel, grain with negative rake angle and grain self-edging function. 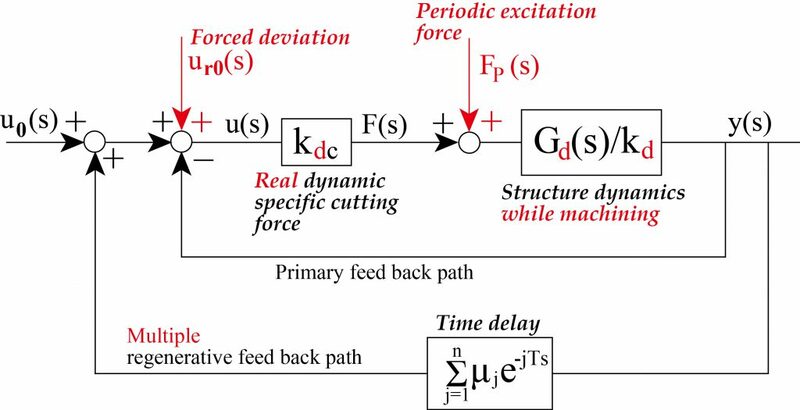 In consequence, we discuss the self-excited chatter of regenerative type in grinding in Section 1.3 and suggest that the chatter theory for grinding does not progress since 1970s. Thus, the editor suggests finally some representative research subjects like “Determination for Contact Stiffness of Grinding Wheel in Consideration of Grain Self-Edging Function”. As widely known, the traditional chatter theory can facilitate considerably the contrivance of the chatter suppression remedy, although suggesting its certain limitation so far. Within various remedies in practice, the utmost excellent remedies are credited to both the milling cutter of irregular tooth pitch type with differing helix angle, and the elastic grinding wheel. Thus, the theory and practice of such milling cutters and grinding wheel are discussed in Chapter 2. In Chapter 2, we give furthermore some quick notes for the positive use of the machine tool joint to increase the damping capacity in the machine-attachment-tool-work system together with suggesting the difficulty in measuring correctly the damping capacity within the system. As can be readily seen from some controversial points suggested in Chapters 1 and 2, the dire necessity is to conduct the further research into the chatter from an innovative viewpoint, so that we may clarify the essential feature of the chatter than ever before. In fact, on the strength of the achievements obtained from the forerunning and challenging research, we suggest a considerable number of the issues in Chapter 3, which cannot regulate by the traditional chatter theory. As will be clear from the above, a crucial issue is to establish an advanced chatter theory, which is fully available for the higher rotational speed of the main spindle at present, and which can be facilitated the analysis of the chatter including the forced excitation caused by the machining mechanism itself. More specifically, Chapter 3 deals first with the influence of the forced excitation inhabiting within the machining mechanism itself on the stability chart, and then discuss the major issues in the three basic expressions for the chatter theory after proposing an advanced block diagram for chatter loop. Following Part I, we display a first-hand view for the research and engineering development conducted in the year 2005 and beyond in the “Headnotes of Part II”. Along with the first-hand view, we show the interesting observation of the chatter while higher-speed machining the aircraft component at present in Chapter 4. Obviously, these ascertain the dire necessity for conducting the research into the issues suggested in Chapter 3. Importantly, as will be clear from the Part I, one of the crucial issues at present is to discriminate the chatter pattern, because we can observe various complex chatters including unknown ones having not been experienced so far with increasing the machining speed. Eventually, such various chatters are caused by the self-excitation of regenerative type to a large extent; however, it is very rare case to observe the pure regenerative type at present. In contrast, each chatter pattern includes, more or less, the influences of forced excitation derived from the machining mechanism itself, and also some peculiar marks caused by the non-linearity in the machine-attachment-tool-work system. Thus, In Chapter 4, a trouble shooting method is furthermore proposed after investigating the chatter mark so far observed. In the proposed method, the chatter pattern may be identified from the sample (reference) chatter mark together with suggesting some recommendable tools to suppress the corresponding chatter. In Part II, the two interesting papers are publicized in cooperation with the potential researchers. These papers deal with the leading issues mentioned in the Part I, to deepen the understanding for the essential feature in the chatter. As widely known, we used to detect various signals related to the chatter, e.g. sound, vibration acceleration, cutting force and so on, with various transducers; however, we have used such signals to identify only the chatter onset so far. Against this context, these contributions suggest further importance of signal processing in detail by exemplifying concretely that the chatter signal involves the valuable information to unveil the essential features of the chatter. More specifically, Professors Archenti and Nicolescu of KTH Royal Institute of Technology introduced the concepts of statistical dynamics for the identification of the dynamic parameters of the machining system, in actual machining operations, by using both the non-parametric and the parametric computational models in Chapter 5. Importantly, these proposed procedures can be characterized by real time estimation of the operational dynamic parameters of the machining system, represented by the interaction of the two subsystems, machine tool elastic structure and cutting process. More importantly, they suggest the importance of chemistry between the real-time identification of dynamics in the machining system with the statistical signal processing as exemplified by the application of “Markov Process Representation”. Chapter 5 can play furthermore the role of a “Position Paper” with respect to the output signal processing when discriminating the properties of the chatter. Professor Schmitz of UNC Charlotte conducts a numerical and experimental investigation in Chapter 6 to accurately predict both stable and unstable milling conditions. He uses the well-known “Poincaré Map” (a phase map between displacement and velocity) to study the self-excited vibrations due to the regenerative effect (called “Secondary Hopf”) as well as instabilities that result in behavior that repeats every second, third, fourth, and so on tooth period (called “Period-n bifurcations”), rather than each tooth period (“Forced vibrations”). In consideration that a crucial issue at present is to improve the applicability of the stability chart while carrying out higher-speed machining, furthermore, a quick note is given for the present and near future perspectives with respect to the dynamic behavior of the main spindle in Chapter 7. In short, it is notable that the dynamic behavior of the main spindle is not clarified as yet while rotating more than 2,000 rev/min, and this is one of the major obstacles to establish a reliable stability chart, which is available for the machining condition with higher-cutting speed. Dare to say, people in chatter concerns are not familiar to the characteristics of the main spindle in detail and its influences on the chatter, although they are interested in such subjects. Thus, the editor suggests some leading research subjects to be investigated hereafter. Paraphrasing, we cannot apply the stability chart to the machining condition with the higher-cutting speed, where we face certain difficulties to determine the parameters of the “Structural Expression” in the chatter theory as already suggested. As can be easily imagined, one of the determinants in this case is the rigidity and damping capacity of the main spindle. In accordance with the aims and purpose of this book, Chapter 8 provides us with the though-provoking quick notes for the research guide to the chatter in metal grinding. As well and widely known, the research into the chatter in metal grinding has been inactive since 1970s, and thus the editor suggest roughly that we have no systematic remedies for the facing problems, which could be derived from the contact stiffness, grinding stiffness, grinding damping and so on. In Chapter 8, these influencing factors to be in current issues are detailed following the quick notes in Section 1.3. It is extremely noteworthy to clarify the influence of the “Unbalance of Grain Distribution” in the grinding wheel on the chatter.